Oceania Cruises is known for offering a wide variety of cruise itineraries, including 100+ day World cruises. Oceania cruises are more inclusive than many other cruise lines, providing free amenities that other cruise lines charge extra for, such as internet access, specialty restaurant dining, and soft drinks. Find a cruise and request a quote using the Oceania Cruises – Cruise Finder. 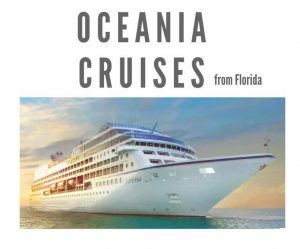 Oceania Cruises ships sailing from Miami include Oceania Insignia, Oceania Marina, Oceania Regatta, Oceania Riviera, and Oceania Sirena. Insignia underwent a multi-million dollar renovation in 2014. This is one of the smaller cruise ships, with capacity for just 684 guest. Private verandas are included with almost 70% of the staterooms. Oceania offers a luxury mid-size cruise ship experience and a variety of cruise itineraries. Marina only occasionally sails from Miami. The Oceania Regatta offers an intimate, classic cruising experience on a recently renovated ship. This 684 passenger ship pampers cruises with luxurious accommodations, fine dining, and great staff-to-guest ratio. Plus, nearly 70% of Oceania Regatta’s cabins have private verandas! This upscale midsize ship offers fine dining and busy itineraries that include stops in ports the bigger ships can’t get to. Refurbished in 2016, and with a guest capacity of just 684, Sirena offers an intimate small ship experience with multiple fine dining options, luxurious spa, and more.